It looks like turtle season is really starting to take off. We've been having a steady trickle of turtles strand on the beaches of Cape Cod, ranging from Sandwich to Brewster lately. Do you ever wonder what happens to the turtles once the great volunteers of MassAudubon in Wellflleet deliver them to the Animal Care Center? Here is a breakdown of what the first week is usually like in pictures. 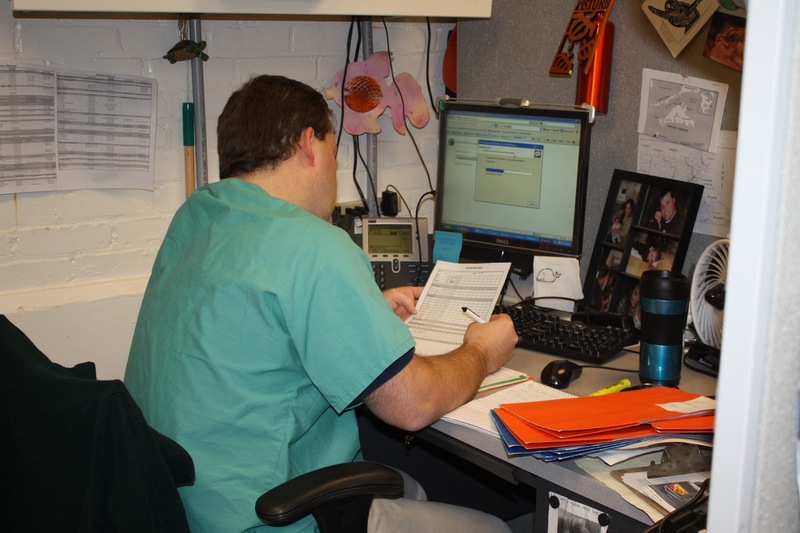 We always start with an intake exam which includes heart rate, blood work, full eye and physical exam, and fluids. In past posts we've mentioned the kiddie pool swims. Once they are more stable and strong enough they will be placed in the larger tanks and start to be offered food. 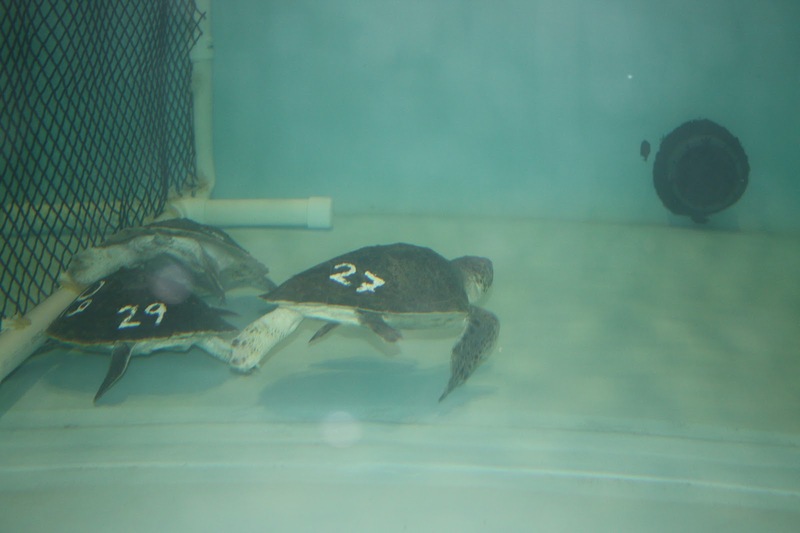 The above photo shows one group of turtles adjusting to their new tank. 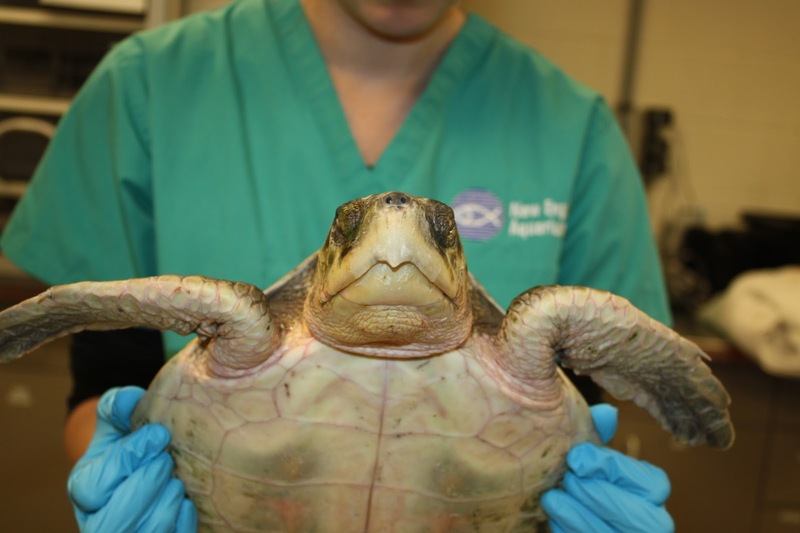 In the first week, most turtles receive blood work every day. We monitor their blood gases almost daily and provide fluids and/or medications to assist in correcting any abnormal blood values. Above, Adam talks over the blood results and receives fluid plans from the veterinarian on duty. The turtles not ready for the larger tanks yet still get swum in kiddie pools at the correct temperature, just like the one above that our volunteer Carla is monitoring. We take notes on their behavior and respirations in the kiddie pool to determine when they are ready for the next step. 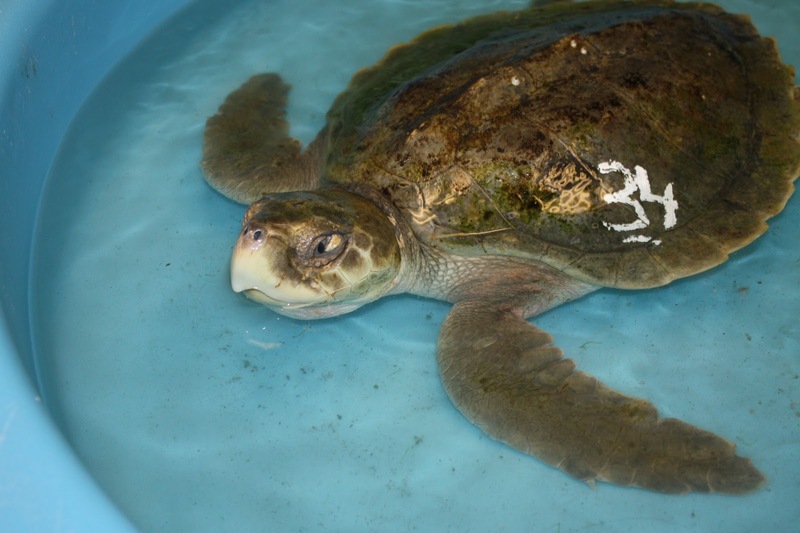 Above is #34, a Kemp's ridley turtle who came in in critical condition. We were able to stabilize him and he is doing well now. In the photo you can see a large scab on his left eye. It is not unusual to see eye injuries from the turtles washing around in the surf into rocks or being accessible to scavengers. 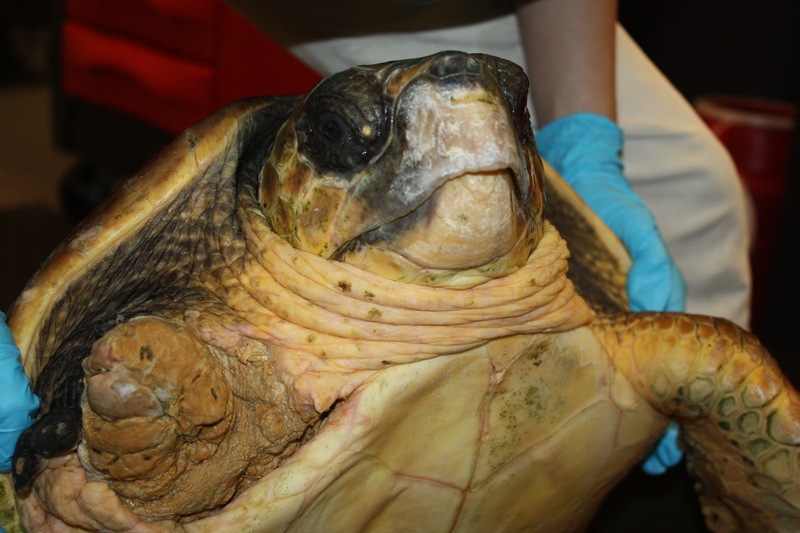 This turtle is on an eye medication every day to help that wound heal. 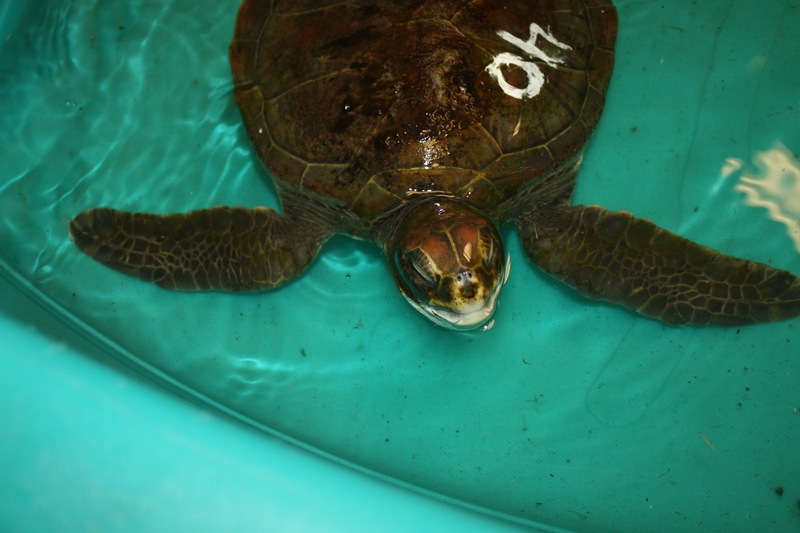 We already have a couple other turtles with similar eye injuries and are on daily eye antibiotics. Most of the turtles we see are very thin, but sometimes they can be extremely underweight as in #28 above. You can see in this photo how sunken his plastron is. This turtle has also been swimming in the large tank for several days now with no interest in food. We are spending significant amounts of time with him in order to get him to eat. We are supplementing him with fluids and injectable vitamins, but if we don't have success soon, we may have to start tube feeding. We are hoping we'll have some luck to avoid this invasive technique, but it may be necessary to get him on track. 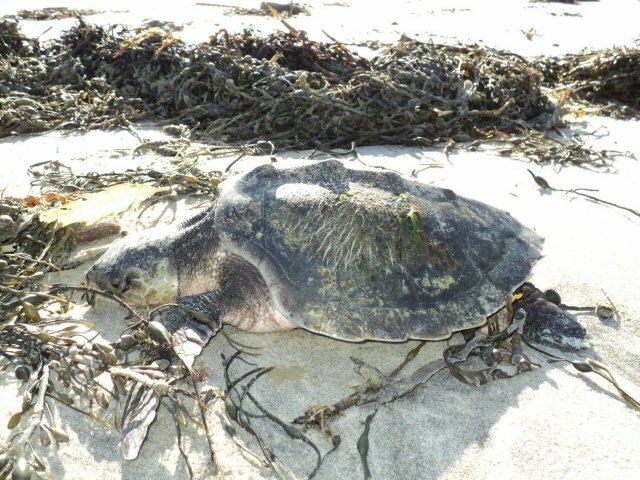 We also have to start saying goodbye to some turtles to make room for more incoming strandings. I mentioned our 3 flippered loggerhead sea turtle in my last post, but unfortunately we will have to say our goodbyes. 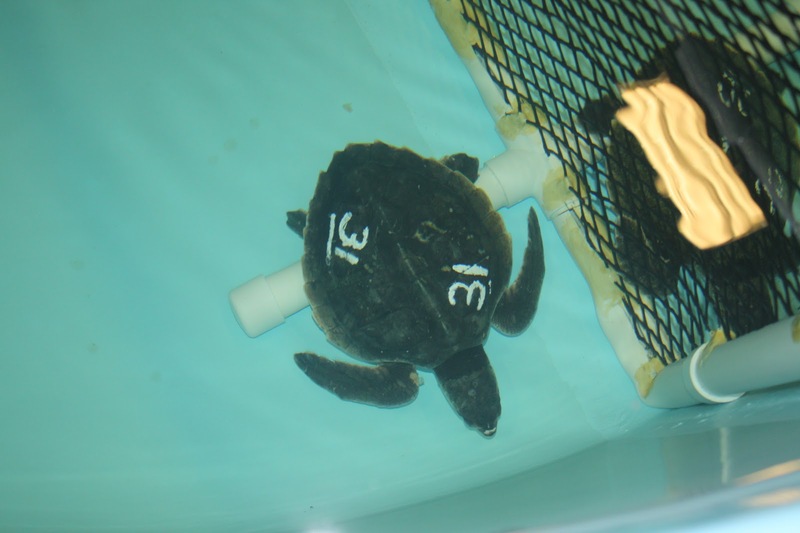 The loggerhead (#23) has been doing great this past week. He swims well in his tank, eats great, and his injury is progressing well. 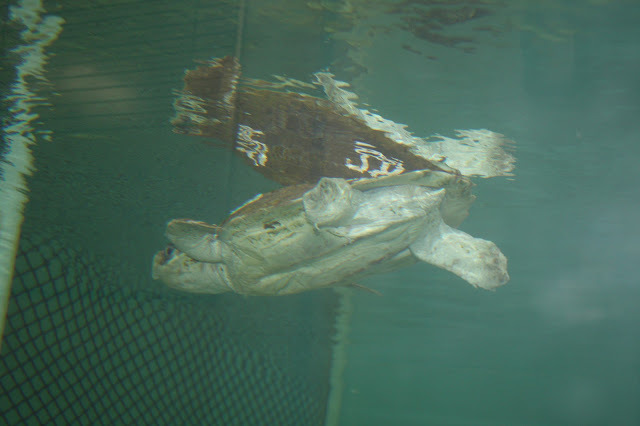 But a large turtle like this takes up a lot of space in our tanks, so we will be seeing him off to a new home today. 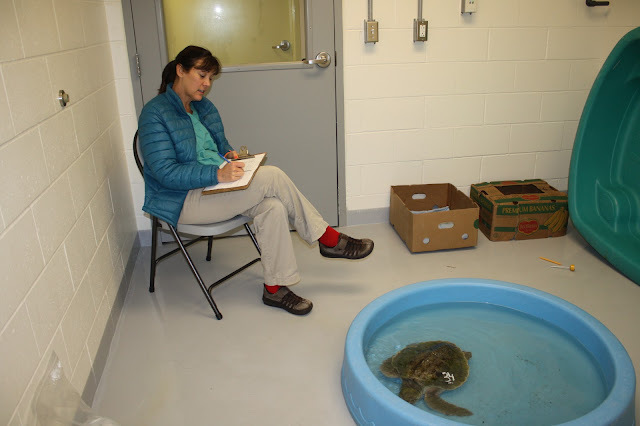 Above, #23, our first loggerhead of the season, gets an exit exam. 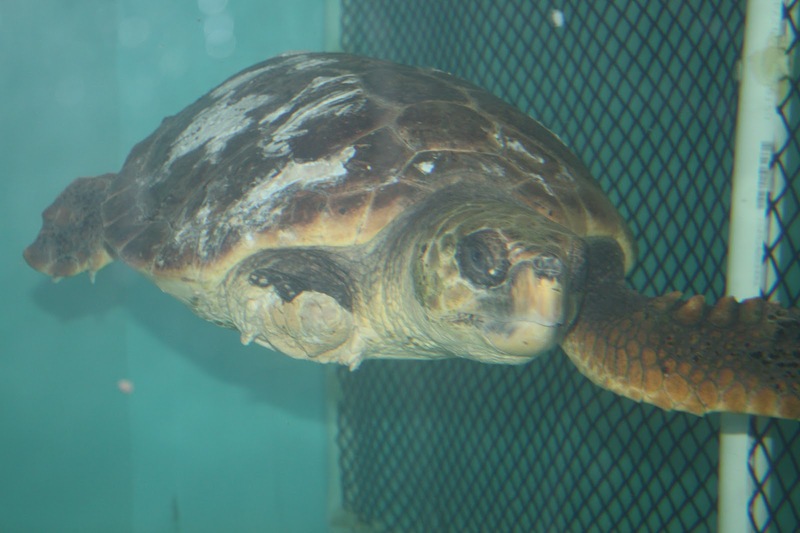 He will be heading to the National Aquarium in Baltimore this week, where he will continue his rehabilitation and hopeful release. Do you remember Laura's guest post on the turtle she found in Dennis? Above is a photo by Laura from her rescue. #31 is the turtle Laura found. I wanted to update you that he is doing great so far. He was very active when he came in and actually not very cold. He started eating the first time he was offered which is a great sign. And more turtles are still coming in! We are up to almost 30 turtles in our hospital now, including this turtle above. This is a green sea turtle and we got two of this species just on Saturday. We'll tell you more about these green turtles, additional happenings of the season, and some special cases that we have been seeing in posts to come.